I love shopping. I love clothes and bags and shoes and pretty much anything having to do with fashion and style. Having a baby girl has opened up a whole new world of shopping (and my wallet, much to my husband’s dismay) and I can’t get enough of it. I did learn with my son, however, that babies grow out of clothes at the speed of light and it makes little sense to spend a fortune on clothing unless it is a special item or for a special event. I also learned that mass produced baby clothes don’t wash particularly well and are not especially well made. When I received two outfits from U.S-based Galante Baby I was impressed by how exceptionally beautiful and amazingly well made they are. Galante Baby was created in the 1950s as an offshoot of Galante’s adult clothing company that was established in 1930 in Kentucky. The clothing and accessories are actually handmade. Yes, that’s right. Handmade! In this day and age it is hard to even fathom any clothing being handmade, but one look and feel of these items and there is no question that these are not mass produced baby products. 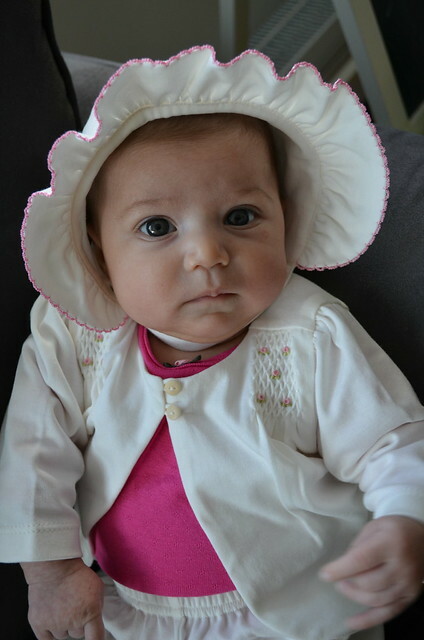 Baby E received the Hand-Sewn Floral Embroidered clothing set which included a cardigan, pants and bonnet as well as the Floral Embroidered Layette and Receiving Blanket. All the items are made from 100% Pima Cotton from Peru and are completely machine washable. The blanket was a generous 29” x 32” and is the perfect weight for spring or summer. The embroidered items have a very traditional or retro feel to them, which is normally not my cup of tea, but after seeing her in the clothes I knew that these would be perfect for a special event or outing. The cotton was amazingly soft and the embroidery was incredibly beautiful. The clothing items are available in sizes newborn and three months. Baby E is a pretty hefty-sized baby and was comfortable in the three month sizing, but I don’t suspect it will fit her for very long as it is just right size-wise. The MSRP on the items is definitely higher than what you would normally expect baby clothes to be (from $25.00 for the Floral Embriodered Bib to $115.00 for the Clothing Set), but the quality and workmanship accounts for the difference in my opinion. These would make a fantastic gift for somebody that is very hard to shop for, seems to already have all the regular brands or has an affinity for beautifully made unique items. Galante Baby can be found online at www.galantebaby.com. I just loved the expression “pretty hefty-sized baby”, sounds just like my newest granddaughter who has just started to walk (11 mth). My daugher just calls her daughter fat! Her brother as just the same as a baby, one roll of fat after another. When I was breast feeding I was told by my midwife that breast fed babies could never be fat – my daugher prove that to be a fallacy producing 2 ‘Michelin men’ so far. The attention to detail looks so pretty! The embroidery looks lovely. I love the hat! These are so beautiful, I can’t believe they are handmade. You can tell just from the pictures they are excellent quality. 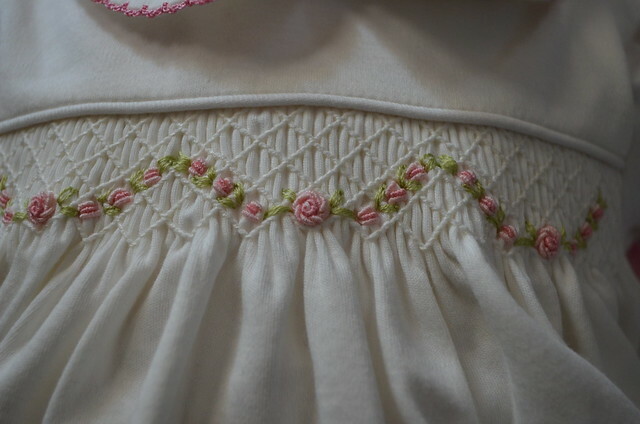 I think these Gallante Baby clothes are beautiful and dainty for a baby girl. I imagine the boys’ clothes are just as nice. It is true that one may get better value by paying more and this seems to be the case here. Thank you for telling us about the Gallante Baby clothing. These clothes look like they are super high quality! Thanks for the introduction to this company! This is just lovely! I went on their website to check out their products for my best friend’s new baby boy and will be sure to purchase something super special. Thanks! Gorgeous clothing! I like high quality clothes as well, but they are almost impossible to find. I love anything handmade. So beautiful. Those outfits are so beautiful.